Total processed: 5971 photographs and negatives since July 7th, 2015. There isn’t a great deal of information readily available about Rolland J. Curtis. A good amount of research is required in order to fill out the early sections of his life, which I plan on accomplishing after the photographs are processed. The information we have is based on newspaper articles and information provided by the volunteer who initially processed the collection. Rolland Curtis moved to Los Angeles from Louisiana in 1942 without even enough money to pay for a formal place to stay. There were no rooms available at the time so the YMCA director was kind enough to let him sleep in a closet at the 28th St. YMCA. His “Hey Coach” greeting became a byword, and even when things were not going well for him, one never knew because he always had a smile and a good word. Curtis earned a Master’s degree in Public Administration from USC as well. He spent four years in the LAPD’s Newton Division as a patrolman with Tom Bradley before becoming Bradley’s Field Deputy in 1964. 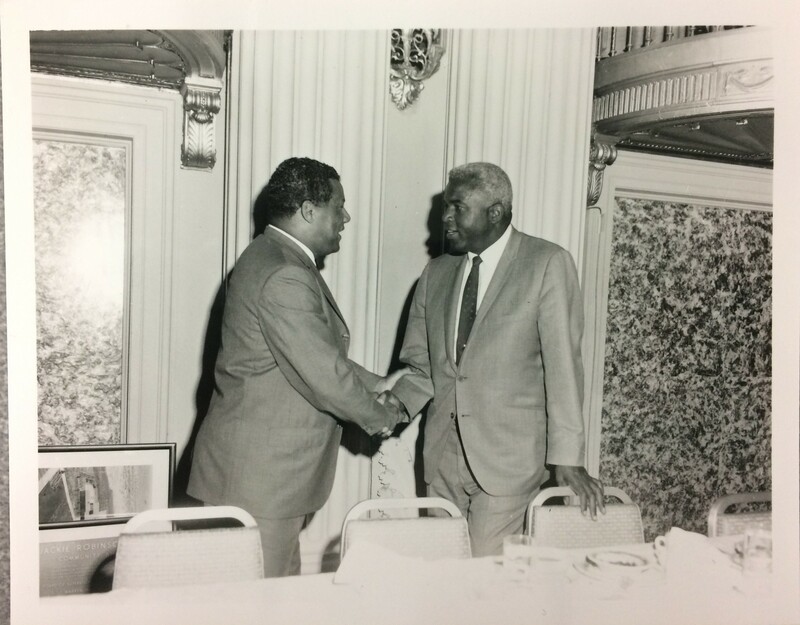 In 1967, Curtis became field deputy for City Councilman Billy G. Mills, where he remained until his assignment to the Model Cities program by Mayor Sam Yorty in 1972. It was during his time as a field deputy for both Bradley and Mills that the pictures in the collection were taken. Whenever there was a community affair, “Speedy” would be seen right down the front, sometimes taking pictures with his huge view camera, or sometimes just there to lend his support to community projects. But he was always there and he always had a smile. There are only a handful of photos of Curtis in the collection, but the photos are rare enough to warrant special consideration. 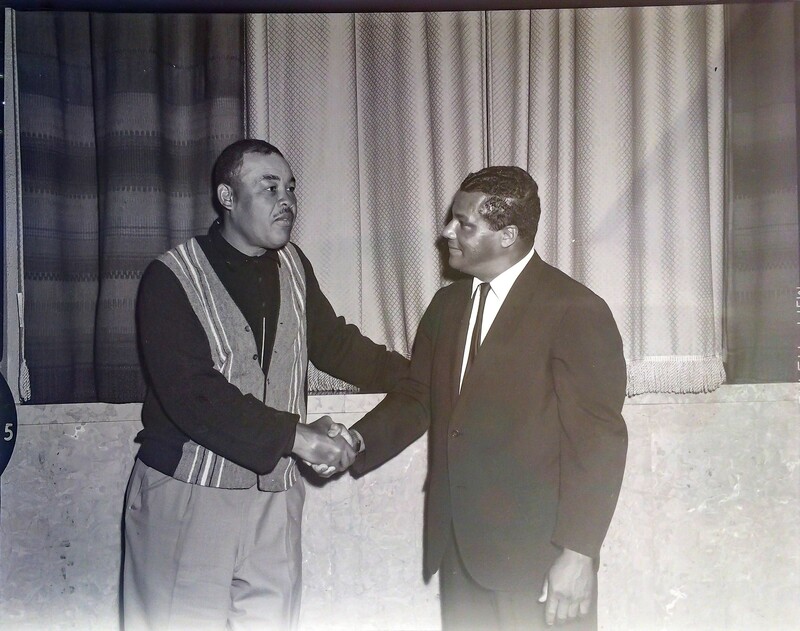 He seemed to favor taking photos with great men in sports. On October 5th, 1972, Curtis was chosen by Mayor Sam Yorty to take over the troubled Model Cities Program. He resigned on February 2nd, 1974 due to continuing issues with the program itself. Curtis began a small publicity business after his resignation called SRO Curtisun Publicisits. He operated a publicity business in a quonset type building off Western Ave. north of Adams. It was the cleanest, the neatest print shop I’ve ever seen. The floors were so clean you could eat off them. The machinery always looked new because it was constantly dusted and wiped and when not in use, kept under vinyl covers. Speedy was proud of that place, and he had every right to be. Shortly there after, Billy Mills called him back to service and Curtis rejoined the councilman’s staff. When Mills was named to the Supreme Court by Governor Ronald Reagan, Curtis ran for his seat against his fellow staffer Robert Farrell. 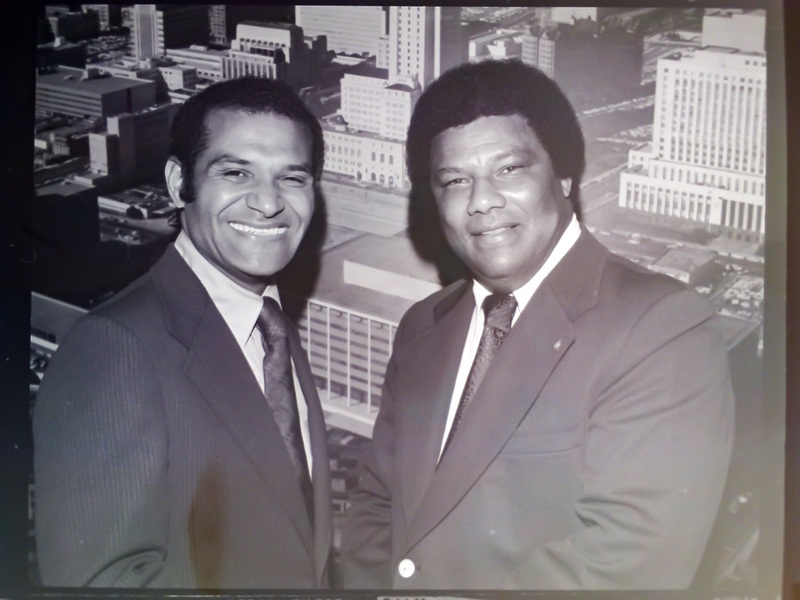 Although he had the endorsement of Billy Mills, Tom Bradley supported Farrell, who ultimately won the seat. 4 years later, Farrell was the subject of a recall and Curtis once again ran for the seat and lost. His ill-fated political campaigns did not leave him with bitterness. His was always a “wait-until-next-time” kind of attitude. On May 13th, 1979, Mother’s Day, Rolland Curtis was delivering Mother’s Day bouquets to women in the community. Acts like this were common with Curtis. Mills recalled Curtis was always concerned about other people, often taking up collections for those in need. “usually without the person’s knowledge. He never forgot his friends and when the holidays rolled around, one could expect to see “Speedy” bearing gifts. His wife Gloria returned from Mother’s Day celebrations later that day and found Rolland murdered, the victim of a robbery gone wrong. Police believed that Curtis interrupted a thief who had snuck through the doggy door and hit Curtis with a blunt instrument when Curtis discovered him. It took 3 years for police to make an arrest in connection with the murder. The man was already serving a sentence and the officers searched through hundreds of fingerprints by hand until they found the suspect. Although charges were filed, we are unsure if the suspect was ever convicted. We are still researching the outcome. 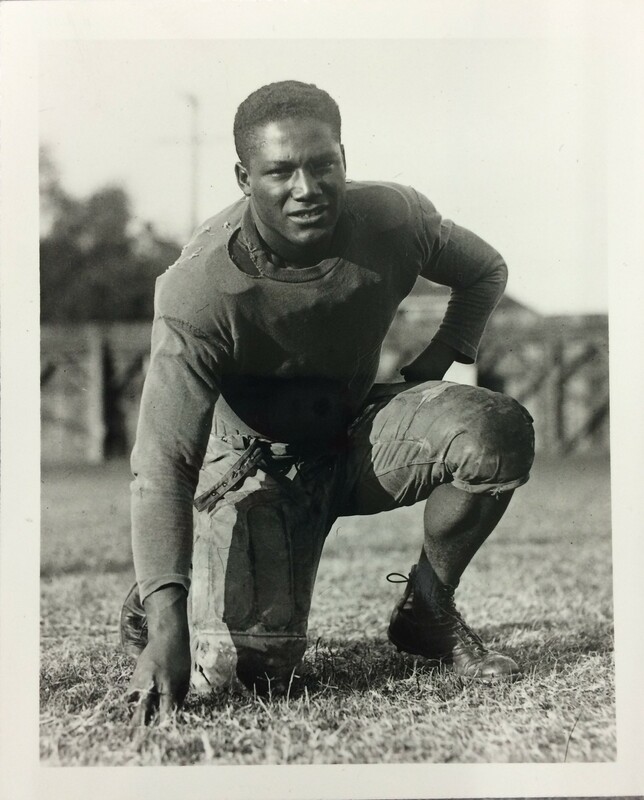 What little we know about what Rolland “Speedy” Curtis was like, we can gather from what was written about him. The quotes throughout this post were snippets from the articles and obituaries written about Curtis after his death. I’ll leave you with one more quote about the man himself. 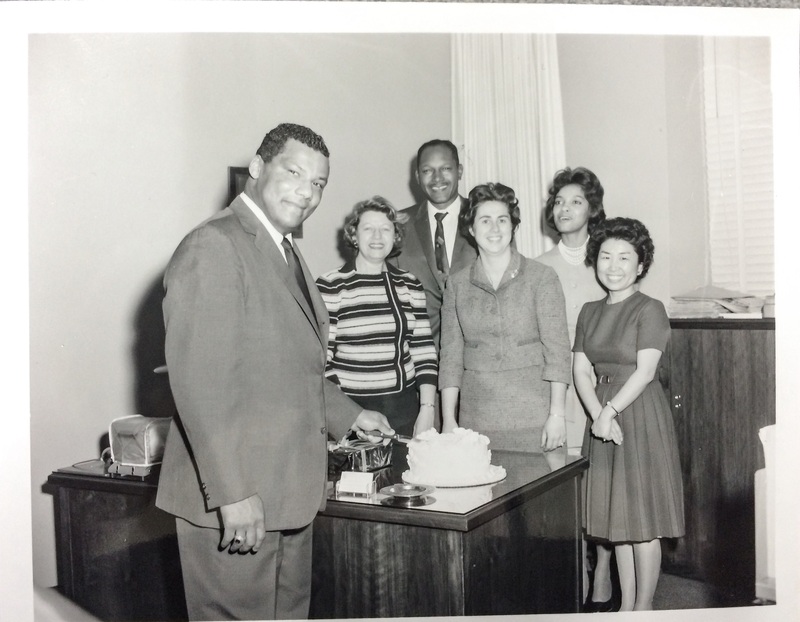 Speedy Curtis, the person, was industrious, gregarious, loud in a non-offensive manner. He was an archetype of the political showman. Possessing a booming voice, he never would greet you in a whisper if he could greet you with a shout. His opening lines were never serious if he could make them comical. His handshake never was merely strong if he could make it a knuckle-crusher. If you ever met Speedy Curtis, the person, you’d never forget him. Speedy Curtis, the political operator, was much like the actor who always plays himself, regardless of the role. Playing himself, Speedy rarely failed to attract attention. “Another Tragedy.” Los Angeles Sentinel (1934-2005), May 24, 1979. http://ezproxy.lapl.org/login?url=http://search.proquest.com/docview/565376434?accountid=6749. “Councilmen Clash Over Model Cities.” Los Angeles Sentinel (1934-2005), Oct 19, 1972. http://ezproxy.lapl.org/login?url=http://search.proquest.com/docview/565019731?accountid=6749. “Council Race Promises Major Battles.” Los Angeles Sentinel (1934-2005), Jan 04, 1979. http://ezproxy.lapl.org/login?url=http://search.proquest.com/docview/565271328?accountid=6749. DOC YOUNG, ,A.S. “Death Scores a Double.” Los Angeles Sentinel (1934-2005), May 31, 1979. http://ezproxy.lapl.org/login?url=http://search.proquest.com/docview/565325983?accountid=6749. Durant, Celeste. “Former Yorty Aide found Slain in Ransacked Home.” Los Angeles Times (1923-Current File), May 15, 1979. http://ezproxy.lapl.org/login?url=http://search.proquest.com/docview/158903909?accountid=6749. Harris, Lee. “Bradley Likely to Endorse Aide in Council Race.” Los Angeles Times (1923-Current File), Jun 08, 1974. http://ezproxy.lapl.org/login?url=http://search.proquest.com/docview/157498870?accountid=6749. “Inquiring Reporter.” Los Angeles Sentinel (1934-2005), Oct 18, 1951. http://ezproxy.lapl.org/login?url=http://search.proquest.com/docview/562233556?accountid=6749. Jones, Jack. “Suspect found in Slaying of Ex-City Aide.” Los Angeles Times (1923-Current File), Feb 11, 1982. http://ezproxy.lapl.org/login?url=http://search.proquest.com/docview/153047202?accountid=6749. L C FORTENBERRY Sentinel,Staff Writer. “Recall Showdown Tues., Aug. 15.” Los Angeles Sentinel (1934-2005), Aug 10, 1978. http://ezproxy.lapl.org/login?url=http://search.proquest.com/docview/565272510?accountid=6749. Mazique, Robert J. “Yorty Moves to Oust Model Cities Chief.” Los Angeles Sentinel (1934-2005), Sep 28, 1972. http://ezproxy.lapl.org/login?url=http://search.proquest.com/docview/565027493?accountid=6749. “Memorial Fund.” Los Angeles Sentinel (1934-2005), Jun 07, 1979. http://ezproxy.lapl.org/login?url=http://search.proquest.com/docview/565380885?accountid=6749. NICK BROWN Sentinel, Staff Writer. “Who Murdered ‘Speedy’ Curtis?” Los Angeles Sentinel (1934-2005), May 17, 1979. http://ezproxy.lapl.org/login?url=http://search.proquest.com/docview/565382619?accountid=6749. “Photo Standalone 41 — no Title.” Los Angeles Sentinel (1934-2005), Aug 01, 1963. http://ezproxy.lapl.org/login?url=http://search.proquest.com/docview/564659894?accountid=6749. I am a Records Analyst for the Port of Portland with 2 Masters Degrees in Library and Information Science and Archival Studies. 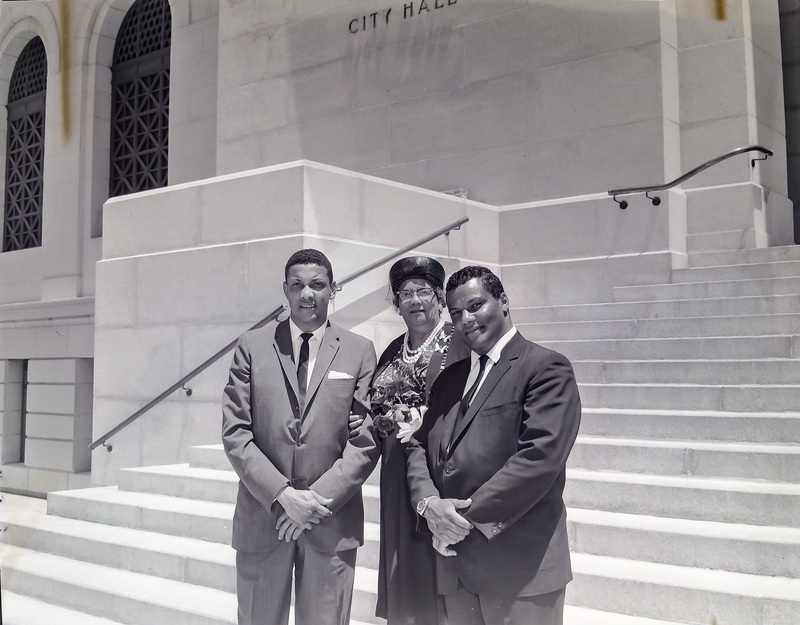 I was the Archivist for the Rolland J. Curtis photo archives at the Central Library of the Los Angeles Public Library. I have a Bachelors Degree in History, during which I wrote about a Labor Union in Los Angeles during the 1950s for dancers called "The Exotic Dancers' League of North America". Rolland “speedy”Curtis is my God father. If he was with us today he would not be pleased in manner in which his namesake has been used..there is rarely a child playing in the play ground at the corner or rolland curtis st. Formerly 38th pl. Probably due to broken beer bottles and grown ups drinking and hanging out etc. And the rolland curtis apt. Buildings where many longterm tenants were displaced due to gentrification and other factors, even though the were promised a place at the new rolland curtis buildings or at the very a chance to stay in los angeles. After everything most of them were not able to rent in los angeles or even stay here. I feel robbed of a positive father figure and a strong role model for our community. I remember he had an orange tree in his front yard..and us kids would yell”speeedy” to let him know we were picking and orange. I miss you.